The Trapeze Jump is a 10 meter high wooden pole with little wooden steps - about the height of two double-decker buses stacked one on top of the other. In the High Ropes course, which is an optional part of most of our NLP courses, you are secured with a safety rope and you then climb the pole, stand on the top, and then jump outwards and grab a trapeze bar hanging a few feet in front of you. Then you are lowered to the ground on the safety rope. Easy! This was November 1998 and I was determined to overcome my fear and climb it as part of a group of colleagues (More information in the second article). Having donned our safety gear we had the preliminary briefing from the High Ropes instructor which included the “Comfort, Stretch, Panic” model devised by High Ropes guru Karl Rohnke. As part of the preparation we had to imagine that we were each surrounded by three concentric circles. So around my feet was my personal Comfort Zone. Outside that by a couple of feet was my Stretch Zone. Finally, a couple of feet outside this was my Panic Zone. We were asked to “imagine that everything you're familiar with is within your Comfort Zone e.g. travelling to and from work, doing familiar everyday things, etc. Your Stretch Zone contains activities which you can 'just about' do but are not comfortable with. Had I really listened and acted on this I could have enjoyed a great learning experience, I didn’t listen and, instead, forced myself to endure the High Ropes in a sort of ‘lets just get it over with - let's not let myself down in front of everyone!’ attitude. And, because of my fear of heights I found the experience terrifying. Rather than being guided by the Comfort, Stretch, Panic model, and because of the silly 'macho' side of my nature, I forced myself to endure lots of Panic Zone experiences that day. And nearly put myself off the High Ropes Course altogether. A couple of months later I thought about Rohnke's Comfort Stretch Panic model and re-approached the Ropes in order to get better at the activities and as part of my training to become a Ropes Course Instructor. Using the model I pushed myself ‘only’ to the outer edge of Stretch – then came back within Comfort. So, for example, I might climb halfway to the top of a pole or tree and then come down. Next time – and it might be fifteen minutes or a few days later – I'd go higher. And I would continue in this way until I'd brought the climb well inside my Stretch Zone. Then I'd climb higher - again stretching myself and until I again almost reached the Panic stage on to another, more challenging activity. After a while I could do all of the activities without entering Panic and after about a year I had qualified as an Instructor. Yet even to this day I find the High Ropes immensely enjoyable - and immensely stretching. The Comfort Stretch Panic model changed my perception of the High Ropes, and of my life. 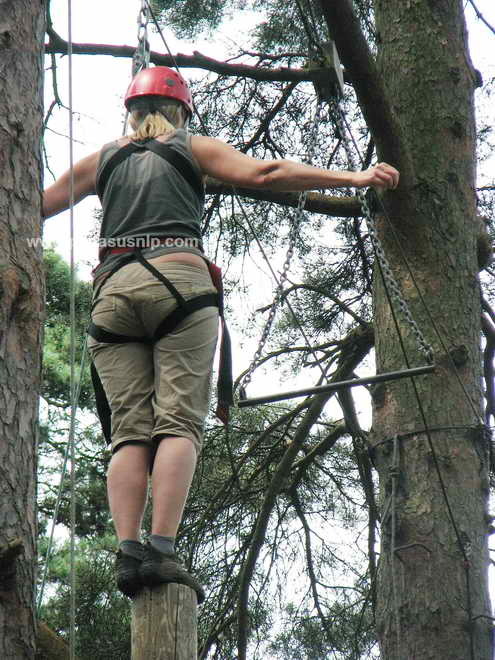 It also convinced me of the value of introducing the High Ropes as a way of giving more depth and practical applications to our NLP courses in the New Forest and we've been using the Ropes ever since. Your Comfort Zone is just that – comfortable – and includes everyday activities such as doing the same things and mixing with the same people. When most of your activities are in this zone life is, of course, ‘comfortable’ but you do not learn very much nor develop yourself – it’s simply more of the same and remaining in it can lead to your Comfort Zone shrinking i.e. more and more activities begin to become stretching. Your Stretch Zone is the area of novelty, exploration and adventure. Here are the things that are a little or a lot out of the ordinary – the things you haven’t done for a long time or have never done before. This zone is not really a comfortable place – but it is a stimulating one. It is where we stretch and challenge ourselves mentally, emotionally or physically. In social life it could be going to a different restaurant or pub. At work it could be handing a project in a new way or seeking a better position. The Panic Zone is the area of things-to-be-avoided either because they are unacceptable to you or because they are currently a ‘stretch’ too far! For example, being dishonest or abusive towards others could be in this zone because such activities are not in accord with your personal values. Participating in extreme sports might be here because you consider them too daunting but ‘also’ because you find the concept of deliberately flirting with danger unacceptable. However you can also have activities in the Panic Zone which you wish were not there. Someone who experiences a phobic response when near a spider might prefer to have more choices in such situations. Again, to a teenager asking someone for a date could be a Panic Zone issue in which they would like to feel differently. And for many people public speaking falls into the Panic Zone with limiting effects on their career. Respecting that my panic may be your stretch! At Pegasus NLP courses we have extended the application of Rohnke’s model into a tool for fostering respect for individuality and respect for oneself. Each person makes their own choice of what is in each zone – and we each recognise and respect the choices made by others. What is a stretch for one person can be a Comfort or Panic Zone issue for someone else. My Panic Zone issue in sports might be merely a mild stretch for you. My Comfort Zone issue in another area might be a stretch or panic issue for you. There are no absolutes – just individual choices or assessments at this moment which may or may not hold true in the future. Like all good models CSP is not just very simple it recognises how un-useful it is to rigidly classify oneself or others. It takes into account how we are continually changing – how we are dynamic systems so what is ‘in’ a zone today might be in a different one tomorrow or in a month’s time. If I commit myself to a period of enthusiastic change I will extend my Comfort Zone. Yet if lots of unwelcome change is imposed on me by ‘circumstances’ I am likely to resist it, become risk averse and shrink my Comfort Zone. Now activities that a year ago I found enjoyable and stimulating are perceived as too threatening. And, once I begin shrinking my Comfort Zone, there is a real risk of the process becoming a way of life. This latter point may explain how difficult it is to get back into the exercise habit after a lazy period. Exercise becomes perceived as being uncomfortable and painful – we know that returning to it will be, quite literally, an uncomfortable stretch. What if we don’t stretch? The adventures and risks that they took as teenagers or younger people can be viewed as alien to doddering thirty-somethings – just as the activities of someone in their twenties or thirties can appear alien to someone in their fifties. And so on. It is a little scary how quickly our Comfort Zone can shrink if we don’t stretch. If we do not endure the unfamiliarity and the slight discomfort of progressively demanding exercise, or if we stick to the same exercise standard and routine, what happens? The body gets used to the routine, adapts to it, and we actually begin to lose fitness. What if we stop exercising? After about 6 weeks without cardio-vascular exercise we have lost 80% of our fitness! It’s a dynamic process - use it or lose it – stretch or shrink. You meet someone, settle down, with or without starting a family. Soon the novelty and excitement wanes. Familiarity breeds laziness. You settle into routines. It's Friday we'll have a bottle of wine and a pizza. It's Sunday let's lie in bed till mid-day, etc. Soon you stop making new friends, lose touch with old ones, and become over-dependent on one-another. And your social skills shrink, too. Many people start doing less and less with each passing decade. Staying in the Comfort Zone becomes all-important! They lose their vitality because they lose their interest in living – and they carry on, just existing. There's no stretch – 'I'm too old for all that, now!' So there's shrinkage. Mental and physical... 'What's on the telly tonight, dear?' Yet research, notably that carried out at Tufts University, has proved how exercise can not just prevent but reverse this age-related decrepitude – and its emotional and social effects. Are you finding ways of making your job stimulating and rewarding? Are you progressing your career by challenging yourself to learn and develop? Or are you filling in time till you retire? People who retire die earlier than people who carry on working because the latter are more stimulated by doing and stretching than by lapsing into Comfort. Depressing stuff? Or a warning? You decide. Are you continually growing, stretching? Because you cannot stand still. It’s a dynamic process. Your personal health and well-being requires maintenance and you can use the CSP model as a useful simple-yet-powerful gauge of how you are doing and as a means of encouraging yourself to begin stretching in all senses of the word. You can have a set of zones for different areas in your life – health, fitness, family and social life, working life, career, etc. Utilise the dynamic nature of the model by taking excursions from Comfort ‘into’ Stretch and back again. As you do this you will find that what was in Stretch becomes comfortable. Now you can move to another stretch activity, and so on. The key is to be in rapport with yourself – allow your feelings to guide you and avoid forcing things. Only move a little into, and only remain briefly in, Stretch. Use this self-rapport to know when you have had enough and then return to Comfort to rest and to integrate the learnings. Now do it again – this time moving a little further so it is a new Stretch. And so on. If an activity currently falls into the Panic Zone, and you would like to change this, your goal is to get it into Stretch. You can do this by using willpower to force yourself but this is a risk strategy. It can work fine albeit with lots of discomfort. But it often results in a ‘never again’ learning experience in which the activity is perceived as permanently in Panic Zone. Another way is to slowly work your way out through Stretch in this area of activity. This will often brings the Panic issues into Stretch. It frequently works fine but it’s slow so, if you want a quicker result, you could use one or two simple NLP techniques such as the Swish or the ‘Fast Phobia Cure’.